The PageScope Mobile Application will change your work style in no time at all. 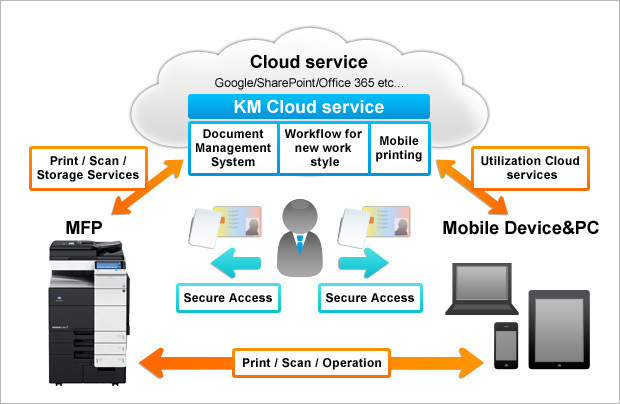 With the clever Application,Konica Minolta multifunctionals can be conveniently connected to Google’s Android devices. Essentially offering two important functions, namely printing and scanning, the PageScope Mobile Application lets you browse, read and order prints of your documents, emails and photos. Likewise, you can load data scanned via a bizhub system. Don’t hesitate to download the handy PageScope Mobile Application, which is available free of charge in the Google play. Your work will soon benefit from enhanced mobility and an attractive overall productivity increase. Using the Android device version of the app. During meetings, smartphones snap photos of ideas sketched on a whiteboard and print them on the spot or share them with other smartphones. Everyone participates in sharing the same ideas. Print documents and share information with team members. Handwritten notes can be scanned on the spot and shared with everyone. Print information and bring it to clients. Information can be shared as a handout or integrated as part of a presentation on Android tablet. In the near future, we aim to provide highly valuable services through technological innovation by integrating MFPs/printers, computers, mobile devices and cloud services. Together, these technologies will help establish secure and flexible workflows. Android, the Google logo and Google Play are trademarks or registered trademarks of Google Inc.
Dropbox is a trademark or registered trademark of Dropbox Inc.
Google and Google Docs are trademarks or registered trademarks of Google Inc. in the U.S. and other countries. Office 365 and SharePoint are a registered trademark or trademark of　Microsoft corporation in the U.S. and other countries. All other brand and product names are registered trademarks or trademarks of their respective owners.